Philadelphia, PA, March 21, 2013 — The ABIM Foundation has awarded funding to 21 state medical societies, specialty societies and regional health collaboratives to help physicians and patients engage in conversations aimed at reducing unnecessary tests and procedures. Support for the grant program comes from the Robert Wood Johnson Foundation (RWJF). The grants extend the reach of the ABIM Foundation’s Choosing Wisely® campaign in communities across the United States. Launched in April 2012, Choosing Wisely is focused on encouraging physicians and patients to think and talk about medical tests and procedures that may be unnecessary, and in some instances can cause harm. Since April 2012, 25 medical specialty societies have created lists of tests and procedures they say are overused or inappropriate, and that physicians and patients should discuss. Choosing Wisely grantees will work on projects to help educate practicing physicians about the recommendations from the specialty societies and help build physician communication skills to have conversations with patients about the care they need. Grantees will also participate in a learning network that will allow them to learn from one another and enhance the effectiveness of their programs. The Texas Medical Association (TMA) will promote and disseminate Choosing Wisely recommendations to more than 47,000 physicians and medical students by collaborating with Texas county medical societies, the Texas Osteopathic Medical Association, and state medical specialty societies. TMA will inform and engage patient advocacy groups, employers, and community leaders in the Choosing Wisely campaign in Texas and will create a learning collaborative of practices that have agreed to implement the Choosing Wisely recommendations to identify best approaches for broader replication. The American Society of Echocardiography will build a mobile application that physicians can use to quickly search for and access the society’s Choosing Wisely recommendations and other appropriate use criteria to determine whether a cardiovascular ultrasound exam is appropriate for a patient. Better Health Greater Cleveland will disseminate the recommendations and messages of the Choosing Wisely campaign through in-person educational sessions led by respected clinicians, and state-of-the-art digital education for clinicians and consumers. The effort will target practicing physicians and their nursing colleagues, while leveraging relationships with Northeast Ohio’s medical schools and residency programs to reach medical students and residents. The American Society of Nuclear Cardiology (ASNC) and Massachusetts Medical Society will develop a web-based application to collect data on physician ordering patterns for cardiac imaging tests, with the data being used to define the rate of appropriate and inappropriate referrals, as well as interventions for meaningful improvement. ASNC will also develop a patient-friendly web site for physicians and their patients to inform patients about nuclear cardiac imaging and radiation optimization. Maine Quality Counts will conduct public and physician awareness campaigns utilizing traditional and social media to educate patients and physicians about Choosing Wisely and will provide resources to support informed decision-making about appropriate use of health care resources. They will also work with three local provider organizations that will serve as mini Choosing Wisely pilot sites. These sites will select key Choosing Wisely recommendations and a set of specific measures to implement, with a goal of identifying best practices and barriers to change that could be shared more broadly. The grants will run from April 1, 2013 to March 31, 2015. State medical societies and specialty societies will receive $50,000, and regional collaboratives will receive $70,000. The grants are made possible thanks to generous support from the Robert Wood Johnson Foundation. 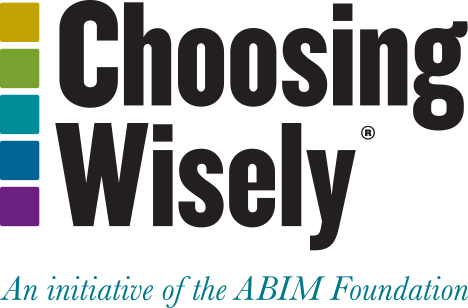 RWJF also provided support for the ABIM Foundation to share best practices through a Choosing Wisely learning network and additional funding for Consumer Reports’ efforts to educate consumers about the Choosing Wisely lists.